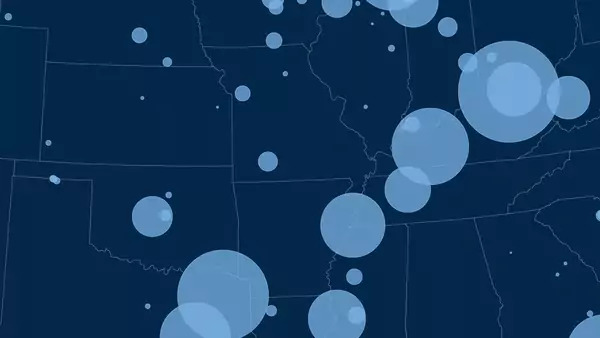 This past year was one of tariff wars, unprecedented cyberattacks, and nuclear saber rattling. CFR editors asked five senior fellows to highlight in charts and graphs how political, economic, environmental, and security developments will play out in 2019. 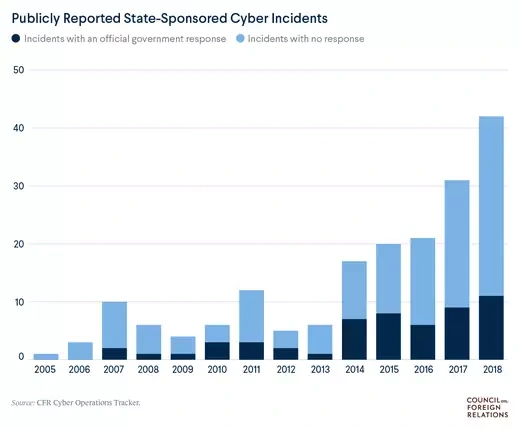 This past year governments continued to call out malicious state-sponsored cyber activity, as cataloged by CFR’s Cyber Operations Tracker. The trend largely began in 2014, when the United States blamed China’s People’s Liberation Army for the theft of commercial secrets. In 2018, more than ten states publicly denounced state-backed hacking, including Canada, Germany, the Netherlands, the United Kingdom, and the United States. Some governments filed criminal charges and levied punitive sanctions in response to alleged Russian and Iranian cyber activity. This uptick is likely to continue in 2019. In its National Cyber Strategy, the United States explicitly said it wants to impose consequences on states it believes violate online norms. The next few years will determine whether these actions are an effective deterrent. Adam Segal is the Ira A. Lipman chair in emerging technologies and national security and director of the Digital and Cyberspace Policy program. This was the year that President Donald J. Trump—a self-described “tariff man”—delivered on his threats of a trade war. 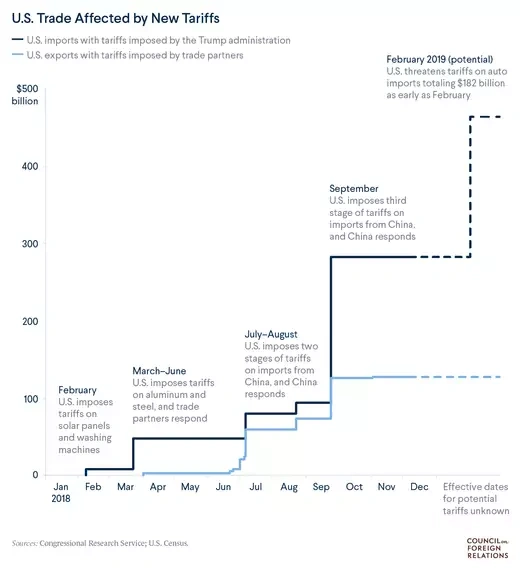 The United States imposed duties of 10 percent or higher on nearly $300 billion in imports in 2018, the largest tariff increase since the 1930s. Foreign governments retaliated with their own tariffs against nearly $150 billion in U.S. exports. The new taxes still affect just 10 percent of U.S. imports, but that could grow substantially in 2019. Trump has threatened tariffs on nearly $200 billion in imports of autos and auto parts, as well as on the remainder of Chinese imports. Edward Alden is the Bernard L. Schwartz senior fellow and author of the book Failure to Adjust: How Americans Got Left Behind in the Global Economy. The nuclear arms control regime stands at a crossroads. Intensifying competition between the United States and Russia in 2019 could undermine the historic progress the two sides have made since the height of the Cold War, cutting nuclear weapons from some seventy thousand then to fifteen thousand today. Two landmark U.S-Russia nuclear arms agreements are in great peril. President Trump has threatened to pull the United States from the 1987 Intermediate-Range Nuclear Forces Treaty, which eliminated an entire class of nuclear weapons, because of Russian cheating. 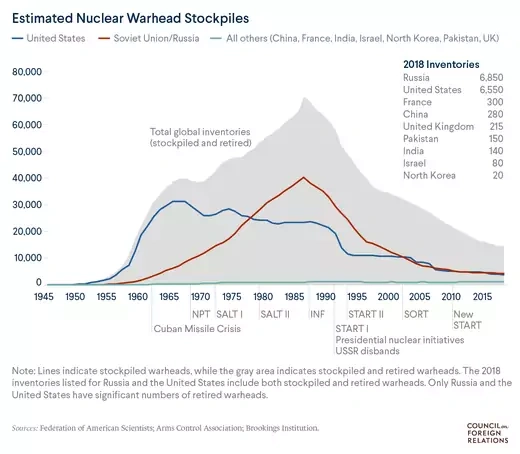 And the 2010 New START treaty, which has steered the two countries down to their lowest nuclear stockpiles since the 1950s, expires in 2021 and has no clear path forward. Instead, both sides are threatening an arms race, including in shorter-range systems, which lie outside of any agreement. Meanwhile, the stockpiles of the world’s other nuclear powers are also poised to grow. North Korea’s development of nuclear weapons and Iran’s presumed ambitions to do so have placed great stress on the Nuclear Nonproliferation Treaty regime, and Trump’s decision to withdraw from the 2015 Iran deal has exacerbated that pressure. Moreover, China, India, and Pakistan are expanding their arsenals, which lie outside of any control regime. Lori Esposito Murray is an adjunct senior fellow. King coal is hitting retirement age. 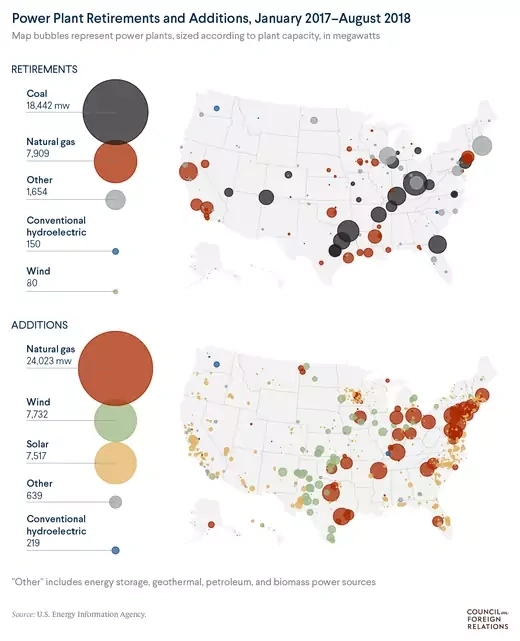 Total coal power capacity in the United States has diminished significantly since President Trump took office, despite his pledges to save the coal industry and his repeal of the Clean Power Plan. Coming online in its place are cheaper natural gas and renewable energy sources, such as solar, wind, and hydroelectric. As a result, carbon emissions from U.S. power generation fell a dramatic 4.6 percent in 2017. This trend looks set to continue in the years ahead. Several newly elected governors—in Colorado, Connecticut, Maine, Nevada, Oregon, and Wisconsin—have pledged to pursue 100 percent renewable energy mandates, mirroring policies recently passed in California and Hawaii. Washington, DC, is also seeking to power its grid solely with renewables. Amy Myers Jaffe is the David M. Rubenstein senior fellow for energy and the environment and director of the Energy Security and Climate Change program. 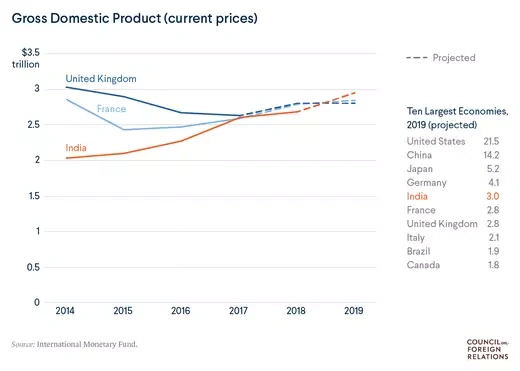 India’s economy long ago eclipsed that of the UK in terms of purchasing power parity, but this new milestone reveals a true global power shift. In viewing the shift of economic activity toward Asia in the twenty-first century, the world would do well to note how much of that occurring is in India. Alyssa Ayres, senior fellow for India, Pakistan, and South Asia, is the author of the book Our Time Has Come: How India is Making Its Place in the World. Will Merrow produced this roundup.